Pixar Animation Studios proudly presents: Birth. An infant opens her eyes for the very first time. We bear witness to this miracle from her perspective. We take in light and sound and movement and color, and then notice the beaming figures who she will know as her parents. In their faces are two seemingly opposite but utterly inseparable emotions: Joy and Sadness; joy because life is a precious gift and that awareness is the most powerful emotion any of us will ever know; sadness because of an underlying awareness that this joyful romance is but a passing thing. Alright kids, you having fun yet? 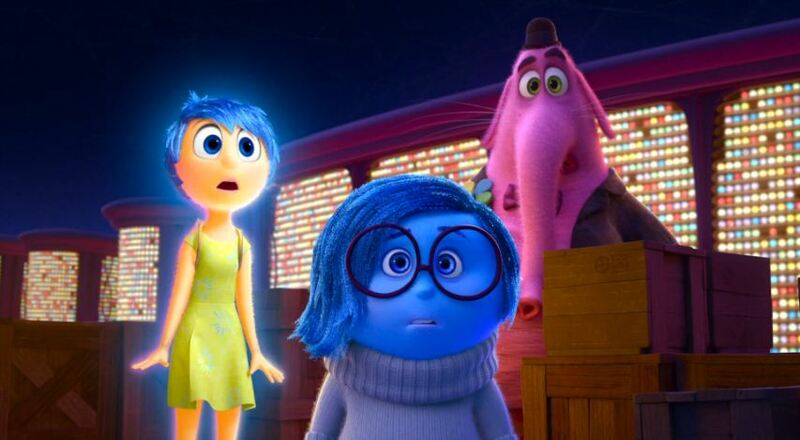 Inside Out is a film that only Pixar could make. I know everyone will say that, but it’s true and it’s kind of incredible. These are difficult concepts for college psychology students, much less children and their parents who want nothing more than to relax their brains for a couple hours at a matinee. 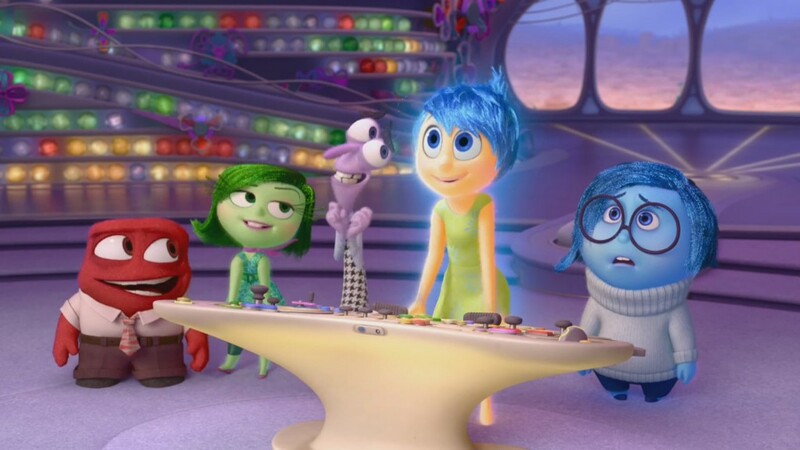 Director Pete Docter (Monsters Inc., Up) and his crew have once again found that sweet spot between, well, joy and sadness, and crafted a tale that harnesses both to their absolute extremes. In a way, this story is the most apt metaphor for the way Pixar makes films. Obviously not every film can make us laugh and cry in equal measure. It would be a shame if they tried. However, Pixar’s specific virtue is their ability to isolate those deeply-held, formative experiences and sensations that we all share. Inside Out finds the essence of joy with absolutely perfect cutaway gags involving the inner life of mothers, fathers, adolescent boys, dogs, and cats. Cats, they reveal, have no inner life. This strikes me as true. And as for sadness, Docter and his team go back to the tried and true well of forgotten childhood memories and the loss of innocence. Riley is growing up, and the simplicity of her old life is giving way as much of who she was fades into the oblivion of her subconscious. Yeah, this is heavy stuff. One particularly sad (and funny) arc involves Bing Bong (Richard Kind, in maybe the best casting decision in the film), Riley’s old imaginary friend. Bing Bong is hilarious as the invention of a young child’s mind, but it’s also clear that he is operating at the edge of Riley’s consciousness soon to be forgotten forever. This could be unbearably maudlin handled by someone else, but Docter treats it as subtext which makes it all the more effective. It’s just one of the things, so important at one stage of life, that fades as we grow older and deal with new problems. And of course there’s fear. What kind of Pixar movie would this be without a gaping black hole somewhere representing death into which our heroes must eventually travel without any guarantee of return? 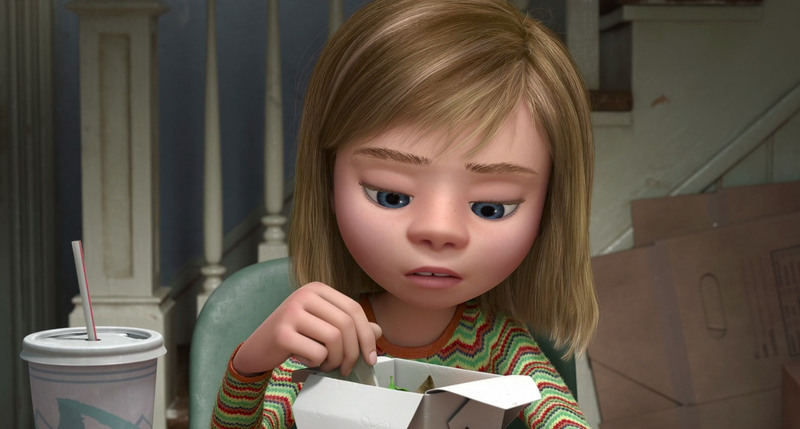 If Inside Out had been released five years ago, I might have had a few more complaints. Under the pre-Cars 2 veil of innocence, Pixar seemed an invincible force of innocence, integrity, and excellence above and beyond the corrupting forces of capitalism and human error. 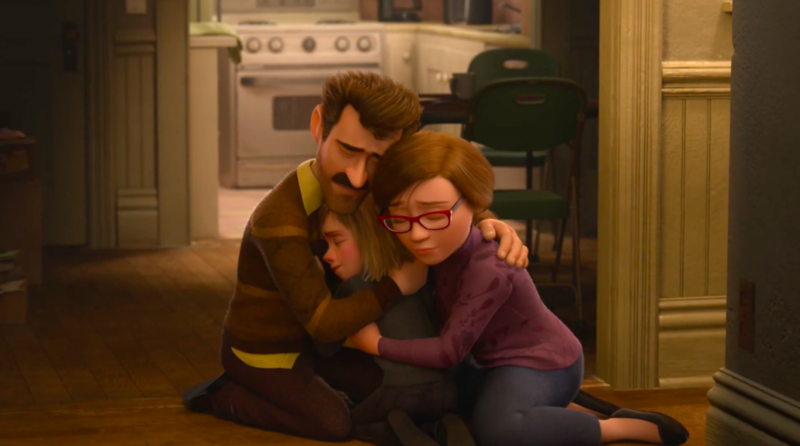 Taking for granted that a film like Inside Out does everything, and I mean everything, a family audience could possibly ask from their shared entertainment, I might have complained that the film’s animation is nowhere near as memorable as, say, The Incredibles or Ratatouille. The best Pixar films don’t just tell a good story. They’re some of the most beautiful, iconic looking things in all of world cinema. The inside of a young girl’s mind is rendered here as an elaborate fantasy world full of rich metaphors and inside jokes, but it doesn’t exactly pop with the same completeness as Up’s South American plateau’s or Wall-E’s post-apocalyptic consumer wasteland. In truth this candy-coated island of primary colors feels a bit generic. Also there’s a sense that Pixar is reaching a bit deeper into their memory bag than usual. Riley bears almost too much resemblance to Toy Story’s Andy, while her psychological avatars Anger, Disgust, etc. are just more literal versions of Woody, Buzz and co. Bing Bong could easily have shown up in those earlier films. And while it’s hard to fault any animation studio for leaning on the sturdy buddy comedy format, Joy and Sadness’s trek through Riley’s inner psyche evokes some major comparisons to Finding Nemo, although the worlds here are nowhere near as vivid or exciting as the Australian reefs. These are all things I would have brought up five years ago. Funny how experience changes perception. Despite respecting Brave’s attempt at a female-empowering princess film and enjoying Monsters University for what it was, I’ve realized with each minor Pixar effort just how difficult and rare their great films were. For fifteen years these guys weren’t just the best studio animators in business. They were the best universal entertainers in maybe the history of movies. I couldn’t help but marvel at the way Inside Out took an audience ranging from the ages of four to sixty and had them all crying in unison, all laughing at the same jokes. This isn’t the Dreamworks school of thought where the kids laugh at one thing, the adults another. Every moment of this film exists to be enjoyed by every person in the audience. It’s a monument to all that is universal in human experience. And even though we all grow up and life becomes more complicated than a handful of basic emotions can account for, there will always be our five year old selves, ten year old selves, fifteen year old selves, and onward somewhere inside. Once again Pixar has proven that they are the grandmasters at letting all those selves out.